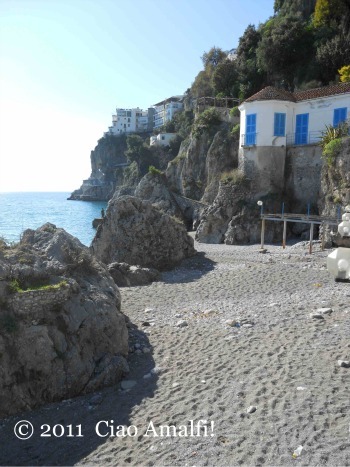 February is a quiet month on the Amalfi Coast, with the exception of the very loud celebrations for carnevale. Yes, it’s carnival time again. Around the Amalfi Coast it’s a festive celebration that includes parades with large floats, kids with entirely too much confetti, and, my favorite part, lasagna. (I’ll share more about that below.) The carnival events add a burst of color to what is traditionally a peaceful time of year. This is the month that many restaurants and stores close for annual holiday time or for maintenance work. Soon things will slowly start coming back to life as preparations begin for another busy season ahead. In the meantime, I love these quiet days, especially when the sun shines. Here’s a look at a few things going on this month, along with some tips for enjoying the Amalfi Coast in February! When most people thing carnival and Italy they imagine all those gorgeous masks and costumes in Venice. That’s not at all what the celebrations look like in much of Italy. If you’re at all familiar with what carnevale looks like in the Italian city of Viareggio, with its massive floats and parade, that’s much more along the lines of how it’s celebrated in this part of Italy – naturally just on a much smaller scale. While there are parades and celebrations, often geared toward kids, in many of the towns along the Amalfi Coast, Maiori is the center of carnevale events. (In large part because they actually have space to make floats and have a parade!) With their Gran Carnevale di Maiori, they have a series of events from February 10th to the 18th. The parade with the floats will take place on Tuesday, February 13th at 3pm. You can see the full events for the Carnevale di Maiori here (Italian only). Of course you can’t have a holiday without good food! 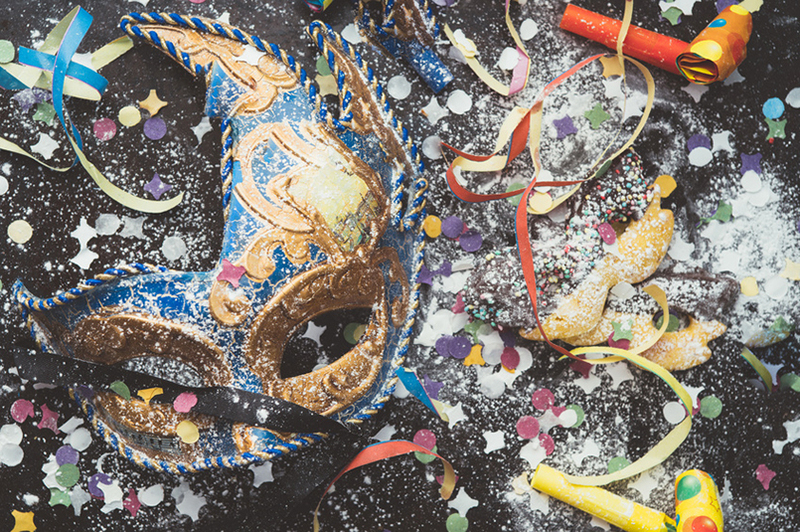 As it was traditionally considered the last big hurrah before the period of Lent leading up to Easter, the customary meal for carnevale is quite lavish. Along the Amalfi Coast that means cheese, salami, cured meats, rich pasta dishes, more meat, (usually more cheese) and lots of sweets. Many families prepare an incredibly rich and delicious lasagna enriched with sausage, little meatballs, spicy salami, hard boiled eggs and mozzarella. It is divine. I look forward to it all year. (Think Garfield and his love of lasagna.) Since my husband has two sisters and they are both marvelous cooks, it means we usually get to enjoy a double dose of lasagna each year. When it’s time for dessert, usually a large tray of chiacchiere will arrive on the table. 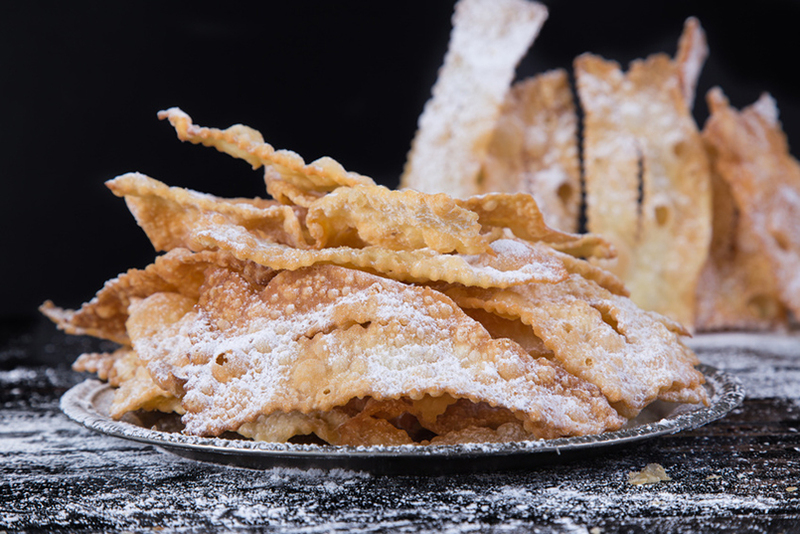 These are thin strips of fried dough topped with powdered sugar. This is a traditional carnival dessert all over Italy and it has many different names depending on where you’re at. While there are countless recipes, the dough sometimes includes a bit of lemon rind or even a splash of limoncello. They make the most delightful tasting mess you’ve ever eaten! 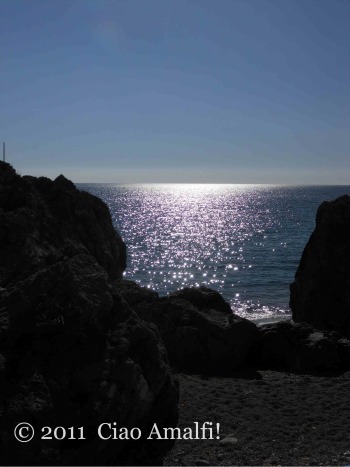 As it’s the quietest month of the year, if you’ve been dreaming of driving the Amalfi Coast Road it’s a good time of year to set off by car and explore the coastline. With less traffic it’s a little easier to stop in scenic spots and enjoy the views. The best part are the colors. If you get a sunny and clear day, the colors of February are vivid and crisp. Just keep in mind that most places are closed this time of year. So don’t expect to rock up to Positano and find all the boutiques open and restaurants to choose from along the beach. But if you’re coming to the Amalfi Coast to enjoy the views and meander around the quiet streets, it’s a wonderful time of year! While you’re exploring the Amalfi Coast, don’t forget that sites like the Villa Romana ruins in Minori are open year round and are free to visit. 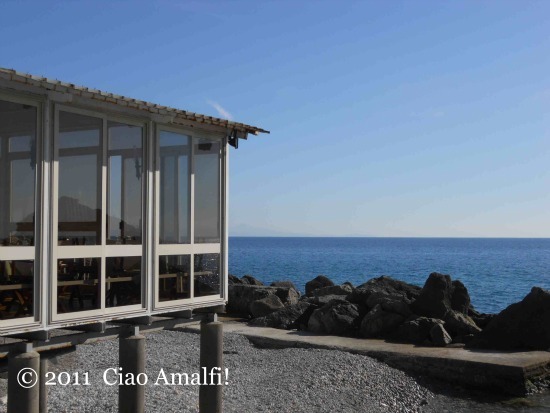 Take note that the Museo della Carta (Paper Museum) in Amalfi is closed in February for maintenance. 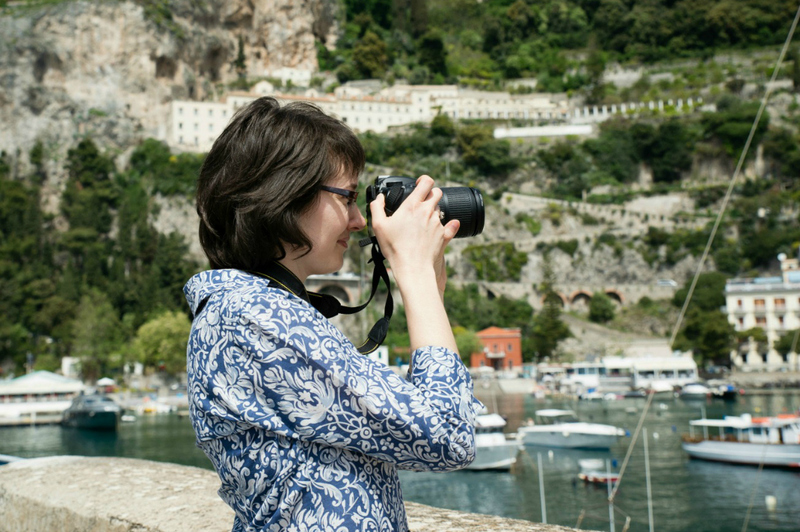 Ah … the month of love begins in the place I love the most – the Amalfi Coast! Of course February means San Valentino, or Valentine’s Day. 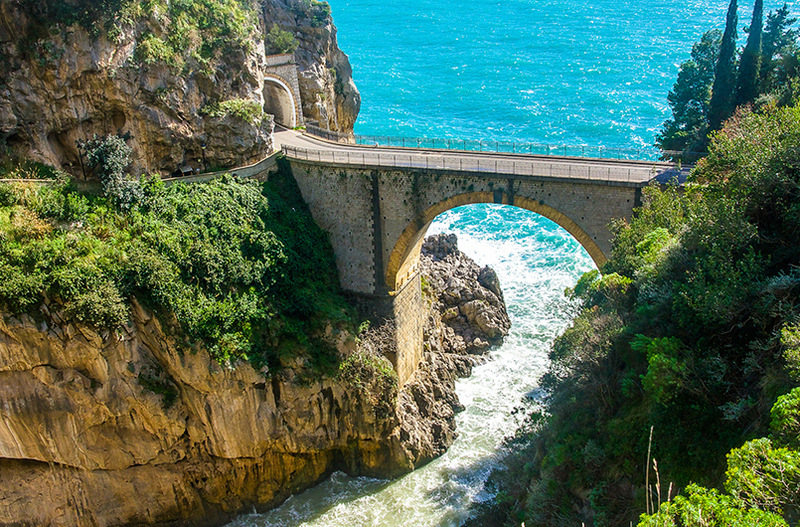 If the weather is nice, our favorite way to celebrate is to head out on a drive along the coastline or simply stroll along the port in Amalfi. No better way to celebrate than just enjoying the place I love most of all. Saturday morning was splendid! Just a few weeks ago there was snow on the mountains, but we opened the windows to find the warm sun shining on the sea and the sky clear. Weekend it was! Walking around Amalfi it felt like spring, with kids out playing on the beach and mounds of winter coats, hats and scarves piled up on the benches and rocks nearby. With the nice weather, the morning errands took a bit longer and soon it was lunch time. The sun felt too warm to go back inside, so we stopped by the Lido delle Sirene restaurant behind the port in Amalfi and asked for something quick to enjoy out on their terrace. 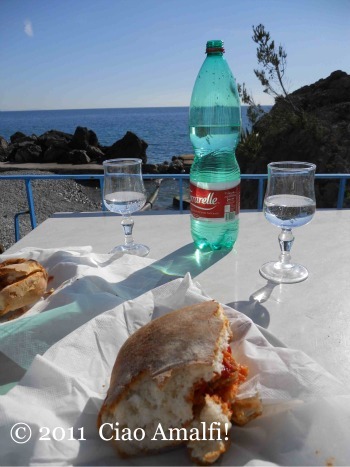 The lunch that arrived was a wonderful treat … panini con polpette (meatball sandwich). With the warm sun and fresh breeze from the sea, for a moment it really felt like summer. 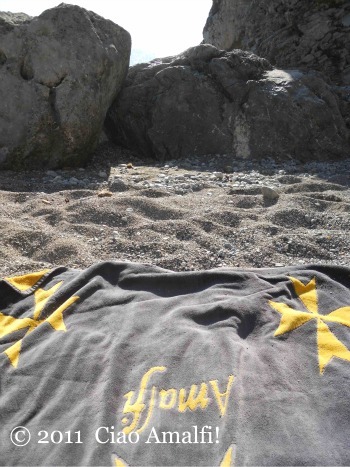 In fact, it felt like summer so much that we spent a hour and a half in the sun on the beach after lunch. This is the earliest my swimsuit has ever made it out of the wardrobe! There certainly isn’t the same atmosphere as the busy summer days, but a warm early spring day like this somehow feels even better. After a winter of being cold, both inside and outside the house, it felt so good to stretch out and soak up the sun! And now I can tell you, spring is really just around the corner on the Amalfi Coast!